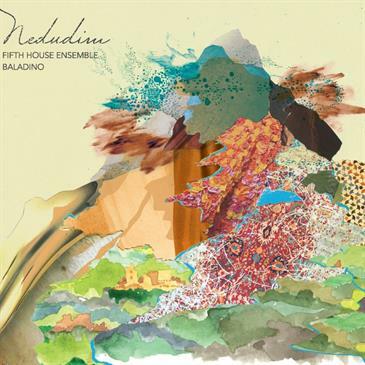 Dan’s music organization Fifth House Ensemble (noted for its “conviction, authority, and finesse” by the New York Times) joins forces with Mediterranean folk band Baladino for an exhilarating, boundary-breaking collaboration. Nedudim, Hebrew for “wanderings,” is a world-premiere album of eleven new vocal and instrumental works created from a palette of international influences, including accents of Indian raga, plus fresh arrangements of folk melodies from the U.S., Europe, and the Middle East. The album’s title evokes its geography-hopping global perspective. Modern orchestral instruments meet their exotic Asian and North African counterparts — oud, bansuri, ney, duduk, and ram’s horn — including Dan’s arrangements and original compositions. The album is now available from Cedille Records. Previous Post Virtuoso pianist Gabriela Martinez has released a new music video of Dan’s solo composition Amplified Soul Next Post Dan Visconti new Director of Artistic Programming of Chicago’s Fifth House Ensemble!